Original Content: Time Management Tuesday: What's The 18 Minutes About In "18 Minutes?" Time Management Tuesday: What's The 18 Minutes About In "18 Minutes?" 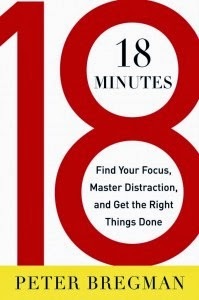 Last week I began writing about 18 Minutes: Find Your Focus, Master Distraction, and Get the Right Things Done by Peter Bregman. But I hadn't arrived at the point in my reading at which he describes what the 18 minutes in the title relates to. Spending 5 minutes in the morning planning your day, working with a to-do list and calendar. Dwell on what you can do that will relate to one of your plans for the year. Then set a timer and at the end of every hour, take 1 minute to assess how you used your last hour and think about the next one. At the end of the day, spend another 5 minutes evaluating how you spent the day. Thus you have your 18 minutes spread over the workday. First off, note that he breaks the day into hour units, though he doesn't discuss the logic behind working in short units of time beyond using it to stay focused. So that relates to time management strategies we've discussed here. As far as using a time/focus program that requires management ten times a day, once an hour for eight hours and then again morning and evening, I know from my knowledge of myself that that's going to overwhelm me. That's actually a lot of work, even though it doesn't require a lot of time. I prefer planning my week once at the beginning, keeping track of what I've knocked off my daily plans, and adapting as I go along, if I need to. I don't want what I need to do to manage my work to become as much effort as my work. However, I like very much his point about being careful to make sure your short-term work plans include working on some of your yearly goals. I'll want to include that in my planning next year.